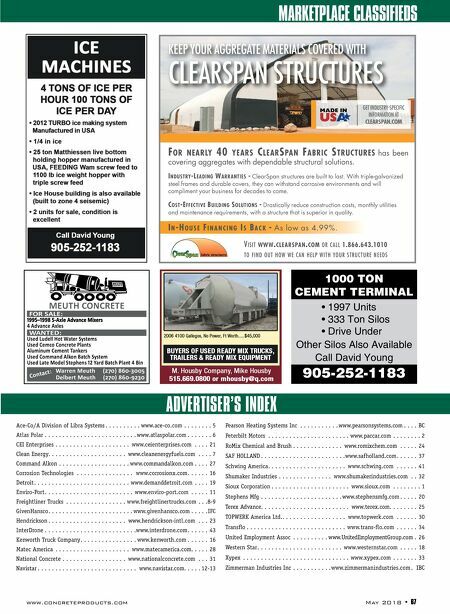 66 • May 2018 www.concreteproducts.com MARKETPLACE CLASSIFIEDS EXCELLENT CONDITION WITH SHOP RECORDS & ENGINE WARRANTY Contact Mark Van de Grift at (937) 237-2872 or (800) 353-1555 or Duane Littlejohn at (937) 339-6249 Georgia Location: Contact David Ernst at (770) 995-9098 ernstconcrete.com Available Now 6 AXLE TEREX MIXERS PRIMAX AIR RIDE AIR CONDITIONING 2013/2014 4 AXLE TEREX & OSHKOSH MIXERS PRIMAX AIR RIDE AIR CONDITIONING 2013/2014 REBAR & WIRE FABRICATION Custom Fabricaঞon of MATS | CAGES | RINGS REBAR & WIRE Cut To Length Quality Wire Forming Leon Stoltzfus Ph: 717-656-4478 SCROMMEL Call 1-800-595-5293 for more information Simple Design & Operation Low Maintenance Factory Direct! sales@scrommel.com www.scrommelreclaimers.com Capital Equipment Co. John Mabry jmabry1818@sbcglobal.net 816-830-6421 Bill Whitaker bwhitaker@everestkc.net 816-830-0165 Sioux air-cooled water chiller systems are available as stationary or portable units with capacities for any size operation. Compared to utilizing ice to cool concrete, Sioux chillers reduce chilling costs by up to 95%. Sioux chillers allow for precise control of water temperature, ensuring consistent concrete and quality. 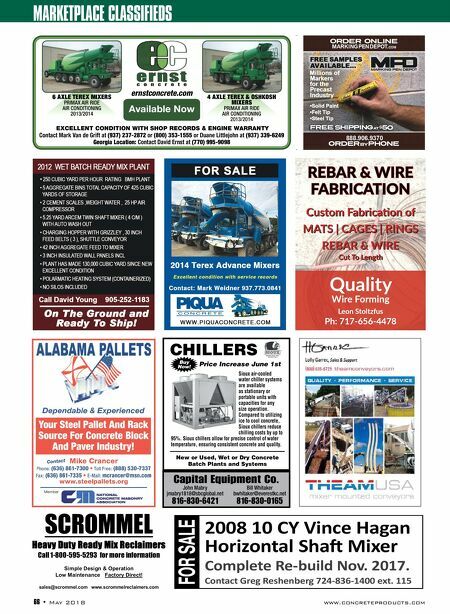 CHILLERS Price Increase June 1st New or Used, Wet or Dry Concrete Batch Plants and Systems Buy Now!